You have an extremely difficult job. I would not want to be in your shoes. As head of the NHL Department of Player Safety, you have the authority to suspend NHL players for a variety of reasons with few guidelines to rely upon when making such decisions. Last night, leading into Game 4 of the Eastern Conference Quarter-finals against the Pittsburgh Penguins and Philadelphia Flyers, you suspended James Neal, Craig Adams & Arron Asham. Your decision to suspend these players could have cost the Penguins their series against the Flyers. These suspensions were all warranted. There was no arguing with the decision to suspend Adams. He violated Rule 46.12 which states no player may instigate a fight in the final 5 minutes of a game. Asham was suspended for cross-checking Braden Schenn in the neck region. You also decided to keep Neal out of action for his shift in Game 3 where he went nuts. Neal took out Sean Couturier without the puck. Then, moments later, took a run at the head of Claude Giroux. I completely understand the suspension of all three players. However, with your high profile position, why don’t you have the referees do something while on the ice? Look at both referees on both hits made by Neal. Is something wrong with that picture? Both refs are looking directly at both hits and neither referee shown in the picture called an immediate penalty. Neal did receive a penalty from the referee at the other end of the ice for his attempted beheading of Giroux. If the refs were doing their jobs, Neal would have never gotten the opportunity to get to Giroux. Couturier was not even close to the puck and Neal could have easily avoided him. Moreover, Neal not only hit Couturier without the puck, but he left his feet as well. Instead of referees handing out 10-minute misconducts in the games following illegal incidents, have the refs prepared to call penalties when they need to be made. On Asham’s cross-check to Schenn and Neal’s hit on Couturier, both Flyers’ players stayed down for quite some time looking as though they were seriously injured on each occasion. Did these players being injured or looking injured have anything to do with you deciding to suspend Asham or Neal? As we’ve gotten deeper into the playoffs Brendan, your decision whether or not to suspend a player seems to have an awfully lot to do with whether the recipient of an illegal hit is in fact injured by immediate impact. If you are going to suspend James Neal for charging, you should suspend Braden Schenn for charging Paul Martin in Game 3 as well. I have to wonder if you did not suspend Schenn because Martin immediately walked away from the hit. However, Martin is now out with an injury. I will bet Martin’s injury has something to do with the Schenn hit. Maybe if Martin would have laid on the ice like Couturier and Schenn, a suspension would have been handed out to Schenn for his delivered blow on Martin. Schenn has left his feet on more than one occasion in the series against the Penguins. I would not be surprised if another Pen’s player is injured from a charge or check where Schenn leaves his feet. We are all trying to figure out how you decide who is suspended. I’m looking for some consistency. If a player receiving a hit is injured the chances dramatically increase that the player who delivered the hit will be suspended. On the other hand, there are other instances that make no sense at all. Shea Weber was bouncing the head of Henrik Zetterberg off the glass like a basketball and Weber doesn’t get suspended. How do you explain that? How can you justify smashing a player’s face off the glass? 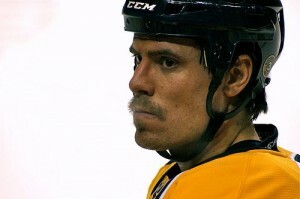 Was Weber not suspended due to the fact that he is the face of the Nashville Predators? The decision not to suspend Weber makes no sense whatsoever. Maybe Zetterberg was not hurt badly enough for a suspension. Since Zetterberg passed his concussion test, the hit must not have deserved a suspension in your eyes. Listen to the commentators. Or, what about when Zac Rinaldo cross-checks Zbynek Michalek in the back twice and then smashes Michalek in the face? Why isn’t Rinaldo suspended? Michalek was down on the ice and in a defenseless position. This was also after the play had stopped, and Rinaldo is not one who has a squeaky clean record or known for being a clean player. Brendan, I am not for or against any specific individual to be suspended or not be suspended. I am only looking for some consistency. There is none whatsoever. You need to set a precedent and not treat each situation differently. You should not have to look at a video to decide if a hit to the head deserves a suspension. The circumstances should not matter. A hit to the head is always worthy of a suspension. There needs to be a strict line drawn. Head blows need to be removed and a standard of play needs to be set in motion. Players know in the back of their minds that they may be able to get away with a dirty play because you treat every incident differently. I do not care if a player delivering an illegal hit has no prior infractions or not, that player needs to be suspended. I am in favor of you suspending everyone until the style of play changes, players stop getting concussions and head shots are diminished. A player should not have to get hurt for you to hand out a suspension. Charging and leaving your feet to hit someone above the shoulders should be cause for suspension no matter if a player receiving the hit is injured or not. That is how you set a precedent and change the way the game is played. That is how you will be most effective in your position as director of NHL Player Safety. The result of a hit on a player’s head should be irrelevant. The fact that a head was hit is the only thing that should matter when handing out suspensions. Please start setting a precedent and suspending players for any illegal contact to the head. We need to keep our superstars healthy, and the main attraction of our game. With the way you are treating each incident differently, you are flirting with ruining a career of one of the best players in the NHL. Start sending a stern message that head shots will not be tolerated under any circumstances.